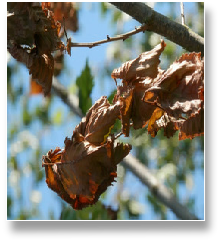 A customer recently brought in a leaf for identification and to also ask why the tree has suddenly started to die. 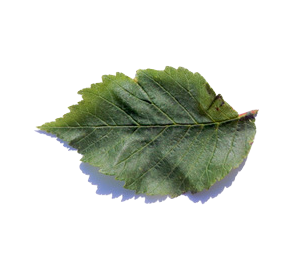 We have a tree which overhangs into our garden that has a few patches of leaves within the tree which are currently showing symptoms of curling, browning and then dropping off. It has happened really quickly and we are concerned the tree maybe dying back? Any ideas, please? Well, let’s first establish the type of tree. 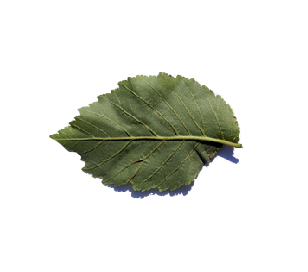 The leaf sample is certainly an elm (Ulmus) with its oval-shaped leaves with a saw-toothed edge.  However, what gives it away is one side of the leaf joins the stalk higher than the other. 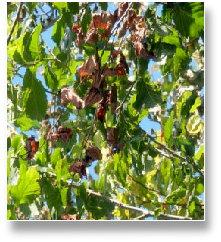 Now being an elm and the tree reaching around 15ft then the symptoms are typical of Dutch elm attack which can occur any time through the summer months, all or part of the foliage suddenly turns yellow then wilts, shrivels and dies. Contrary to popular belief the tree generally regenerates if you prune it hard back to say 5-6ft (1.5-1.8m) produces new, unaffected growth for lower down the tree. You can prune the elm back anytime from September until March. Keep thing tree compact and pruning to keep it below 15ft maybe the way forward to help save the tree in the long term. 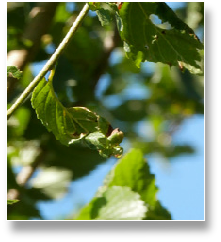 There is no chemical control for Dutch elm disease; however there are varieties with resistance including Ulmus Americana ‘Princeton’ and Ulmus ‘Sapporo Autumn Gold’, the latter one we stock as a bare-rooted tree from late October onwards.